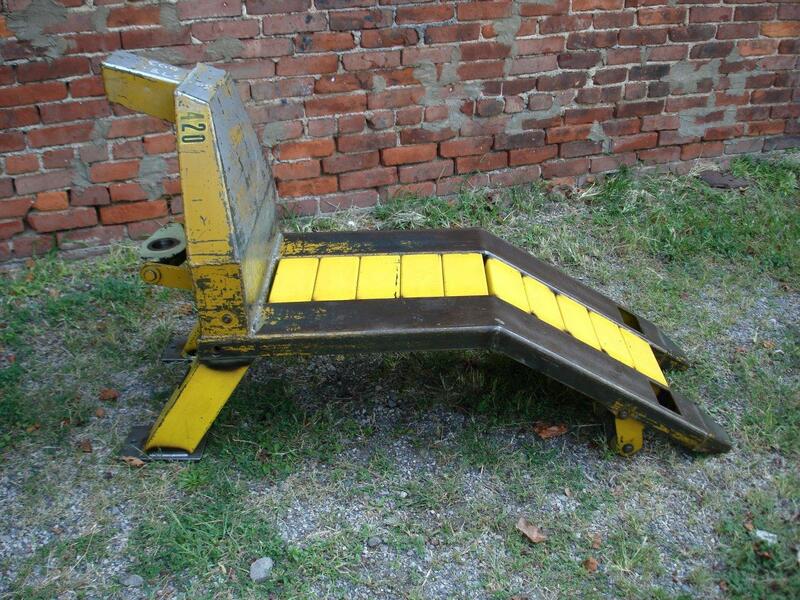 Our legacy was featured in an article by Doug Guth in Crain’s Cleveland. 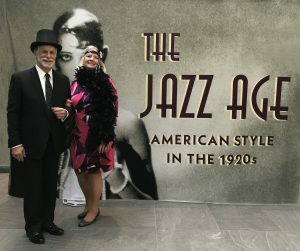 The Jazz Age Show closed yesterday! We would like to express our heartfelt thanks to Stephen Harrison, Sarah Coffin, Bill Griswold, Caroline Baumann, the entire staff at both The Cleveland Museum of Art and Cooper Hewitt and the many generous donors for an incredible experience. Over 250,000 visitors enjoyed an amazing glimpse of history, craftsmanship and American creative spirit. We are honored to have been included. We’re delighted to have shared a very fun evening with so many new and dear friends. We wish all a very Happy Holiday Season! 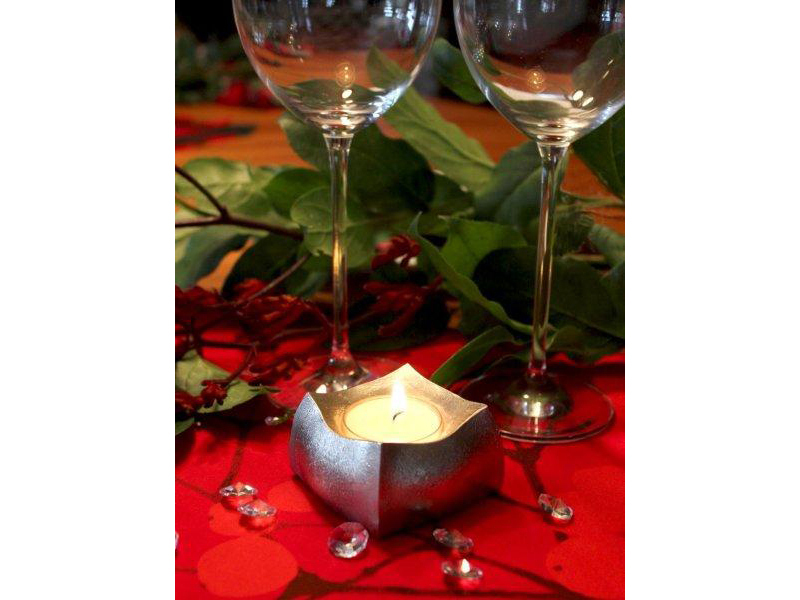 Join us for an Open House & Holiday Boutique! 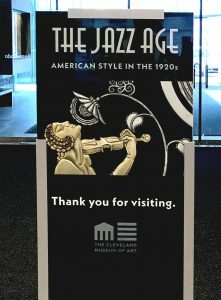 The Jazz Age Show Opens in Cleveland! Bob and Carolyn Rose at the Opening! 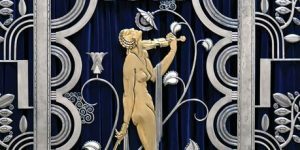 The Jazz Age: American Style in the 1920’s show, immensely popular at the Cooper Hewitt in New York City for the past few months, will open at The Cleveland Museum of Art on Saturday September 30. The first major museum exhibition to focus on American taste in art and design during the dynamic years of the 1920s and early 1930s. Tickets on sale NOW for this blockbuster exhibition! 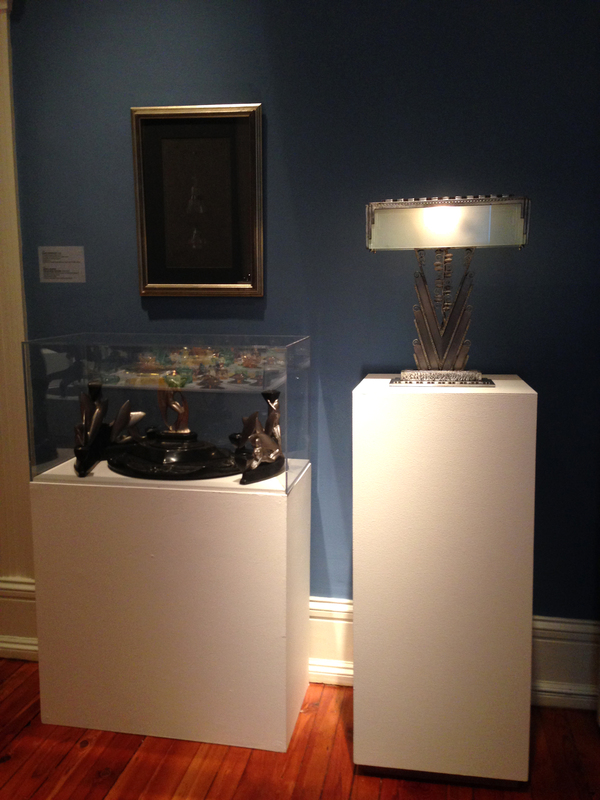 The show features our now American Deco iconic Muse with Violin screen as well as Mirror and Console Table, two pieces which have not been available for public viewing for many years. 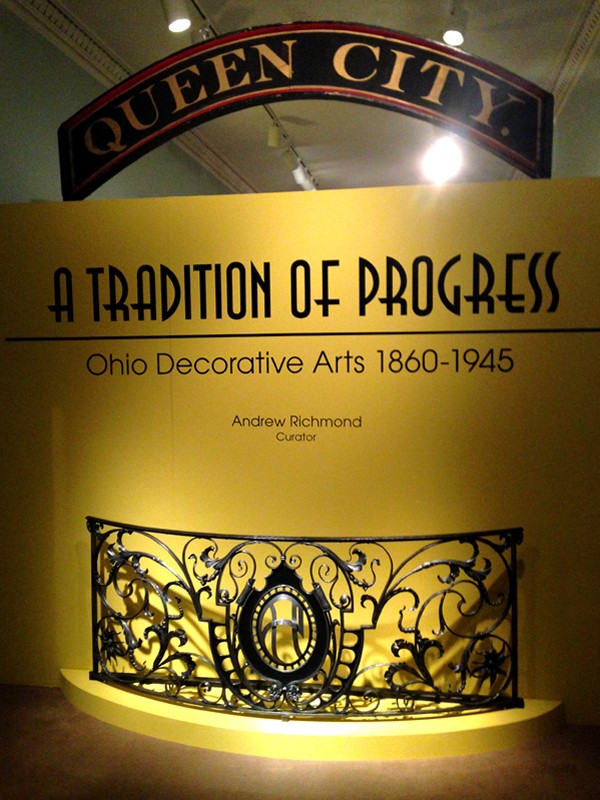 Also displayed is the center balcony railing from the former Drury Theater of The Cleveland Playhouse. It is one of the finest examples of Martin Rose’s traditional work. 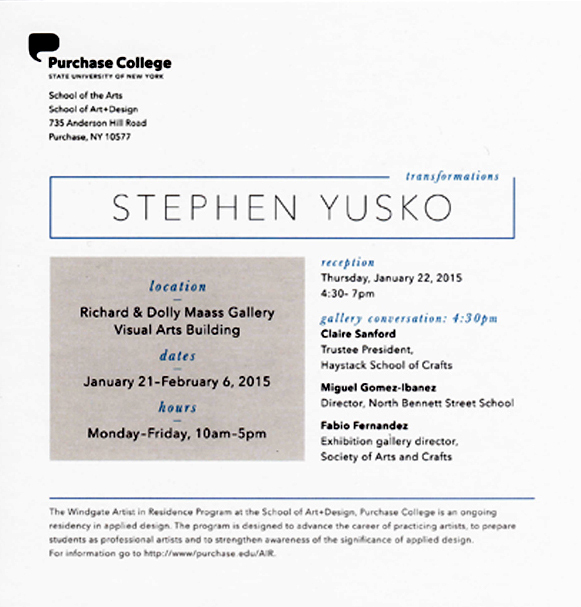 Be sure to look for the catalog of this outstanding show. Click on the first, primary Muse screen image triangle to watch a short video created to feature the show, Rose Iron Works and the screen. Click on Featured Audio to listen to an interview with Bob Rose discussing the origin and creation of the Muse with Violin screen. Page down to watch a short video with fun pre-opening clips and comments by Stephen Harrison, co-curator. 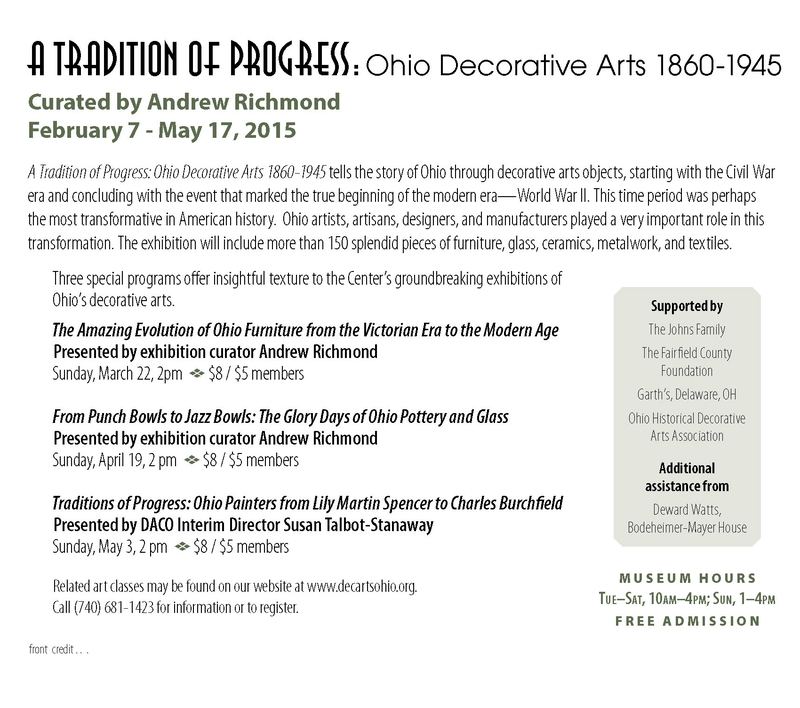 Watch a WKYC interview with Stephen Harrison discussing the Jazz Age show. Read Cleveland in the Jazz Age: Speakeasies, swanky hotels, wild nights and progress in the Fifth City by Laura DeMarco. Enjoy extremely fun vintage photos. 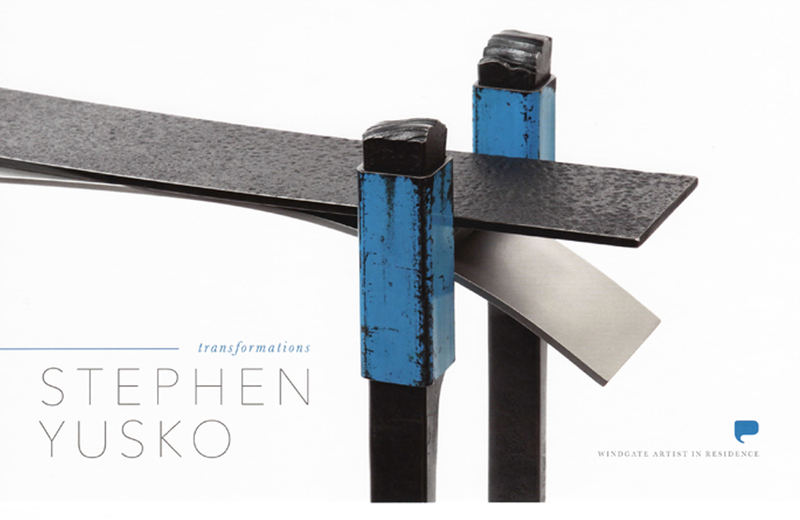 Watch video of discussion of show by Stephen Harrison, Curator of Arts and Design, Cleveland Museum of Art, show co-curator. We are excited to announce the 2017 World Congress to be held in Cleveland from May 14-21. 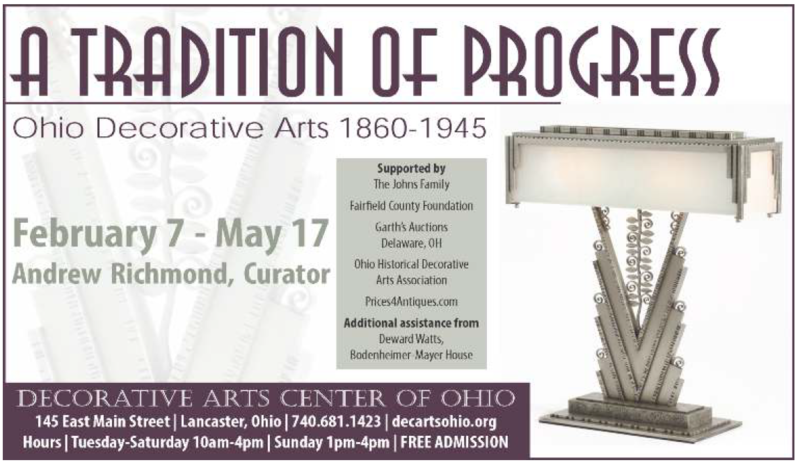 This Congress will focus on the works of distinguished artists, designers, and craftsmen in America’s industrial heartland. Rose Iron Works will be featured. 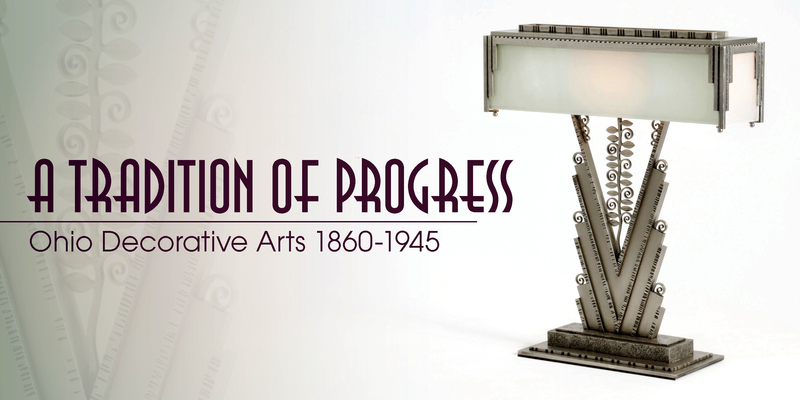 Bob Rose, third generation president, will present Rose Iron’s history, including Paul Feher’s tenure as resident designer, and its contribution to the American Art Deco Movement. 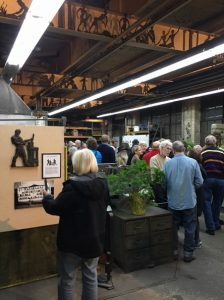 The attendees will tour Rose Iron Works. Pre-Congress events in Cincinnati and Detroit, as well as Post-Congress activities in Pittsburgh and a visit to Fallingwater will all celebrate exciting American Modernist design. For the most up-to-date event information and registration details, visit the official Congress site at ArtDecoWorldCongress.org. Article in the Lakewood Observer, by Gaynel Mellino, describing Overlook Park Neighborhood Association’s visit, and is much appreciated. We are proud that Erin O’Brien featured us in her article Five Rust Belt Places that rock the Flats! In her article, she mentions that our historic work will be included in the Jazz Age Show opening at the Cooper Hewitt Museum, NYC in April 2017. 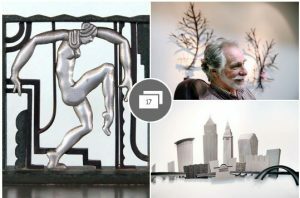 The show, which will include the Muse with Violin screen, a spectacular Deco console table and companion mirror and the railing which once graced the balcony at the Drury Theater, will travel to The Cleveland Museum of Art in September 2017 … stay tuned!! Cleveland #1 – View from the River is the first in our Urban Iron limited edition wall sculpture series. The eight foot wide piece depicts the excitement of Cleveland’s skyline in gracefully crafted outline, enriched with engraved, embossed and forged textures. 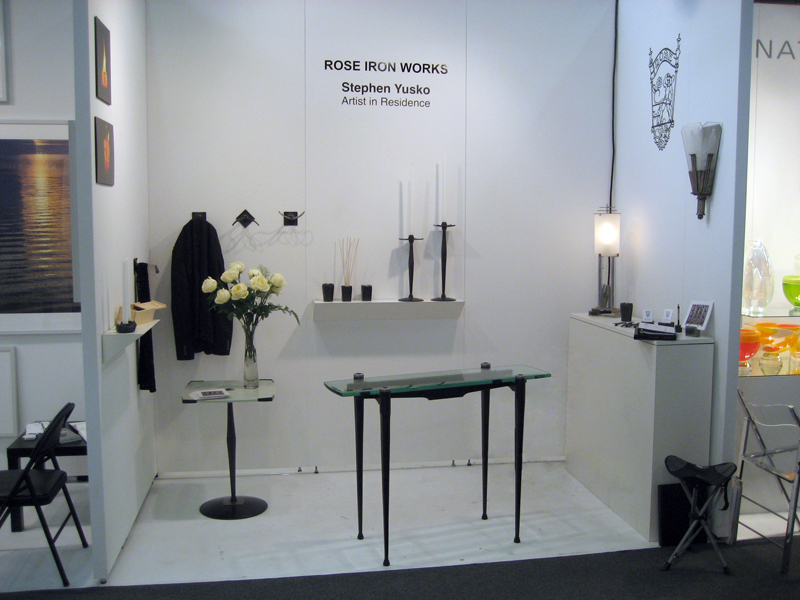 The original design is by Brad Rose with unique interpretation in steel by Bob Rose and RIW’s art blacksmith staff. The next design, awaiting a commission, will be the view from Lake Erie. Cleveland #1 is currently available for viewing in our studio conference room. Custom sculptures are also available. 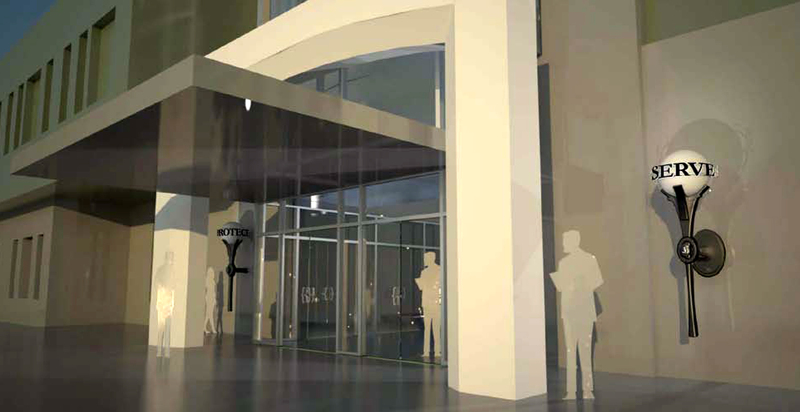 The fixtures described below are now illuminating the entrance of the new 3rd District Police Station. 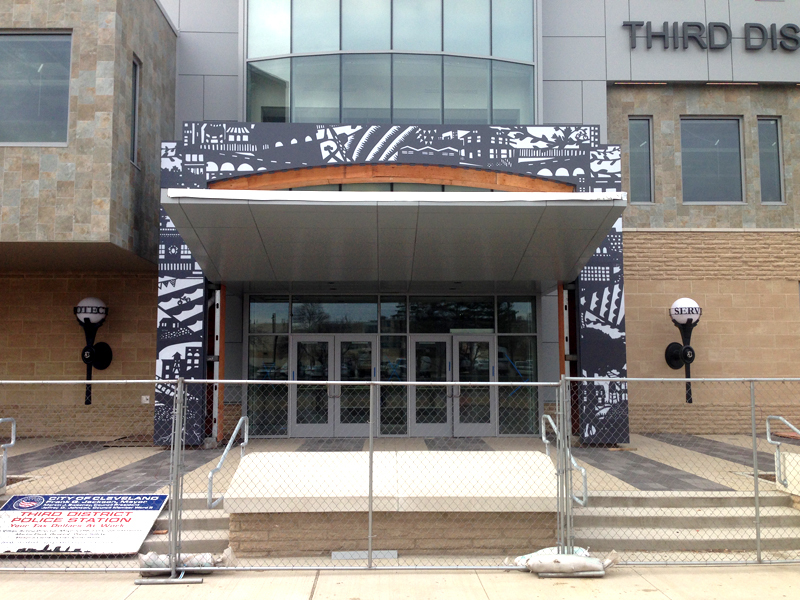 We are honored to have contributed to the enhancement of such an exciting new addition to Cleveland. 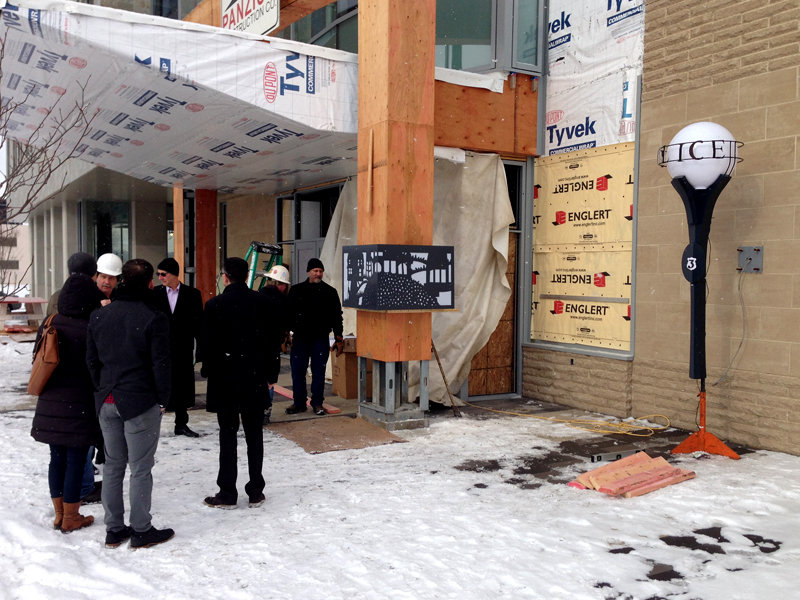 The station has been rightfully heralded as a new wave in creating a welcoming atmosphere for our community. Erin Obrien of Fresh Water Cleveland shares our pride in Commander Pat Stephens’ (and his team’s) service to our neighborhood. We are grateful to Steve Manka and Steve Yusko for their assistance with the fixture’s design as well as to Repko, Atom Blasting and American Japanning for their skills of laser cutting, sandblasting and painting respectively. 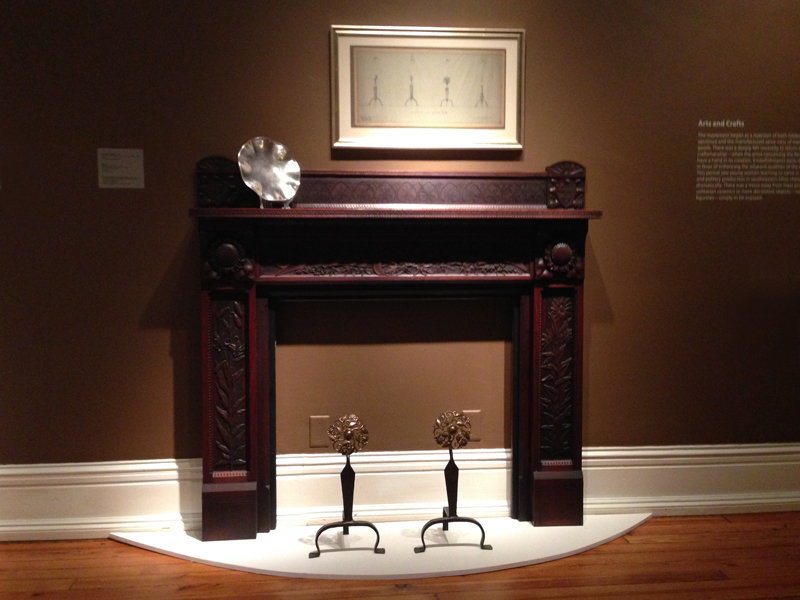 Several Rose Iron Works historic pieces as well as original drawings by Paul Feher are being displayed at The Decorative Arts Center of Ohio, Lancaster, Ohio. The show is curated by Andrew Richmond. Here are a few pics taken at the opening. The railing section, an example of Martin Roses’ finest work, is one which was made for the Drury Theater of the Cleveland Playhouse in the late 20’s. The lamp is one designed by Paul Feher in 1930 .. and is still in production today! Read more about it in the Lancaster Eagle-Gazette. 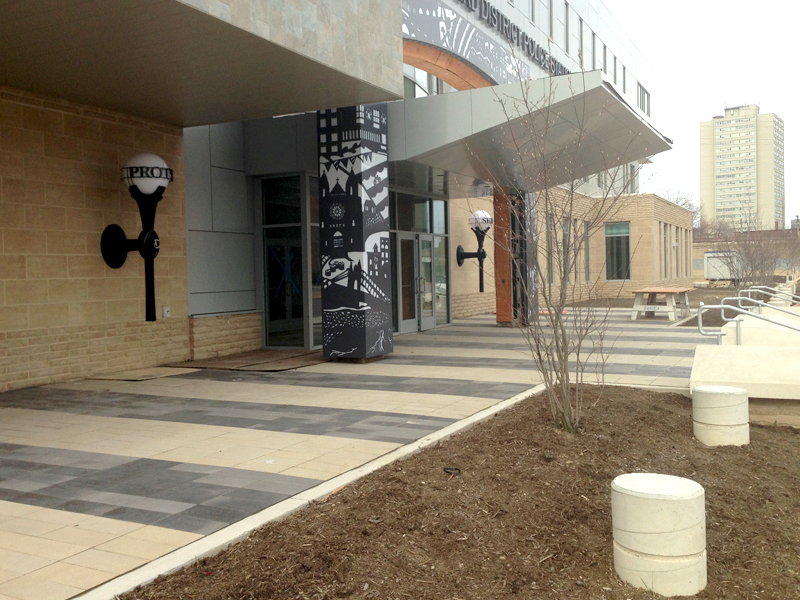 In mid 2014, Rose Iron Works’ design team of Steve Yusko and Bob Rose, assisted by Steve Manka – Manka Design Studio won the public arts competition sponsored by Land Studio to fabricate a pair of entrance light fixtures for the new3rd District Cleveland Police Station. 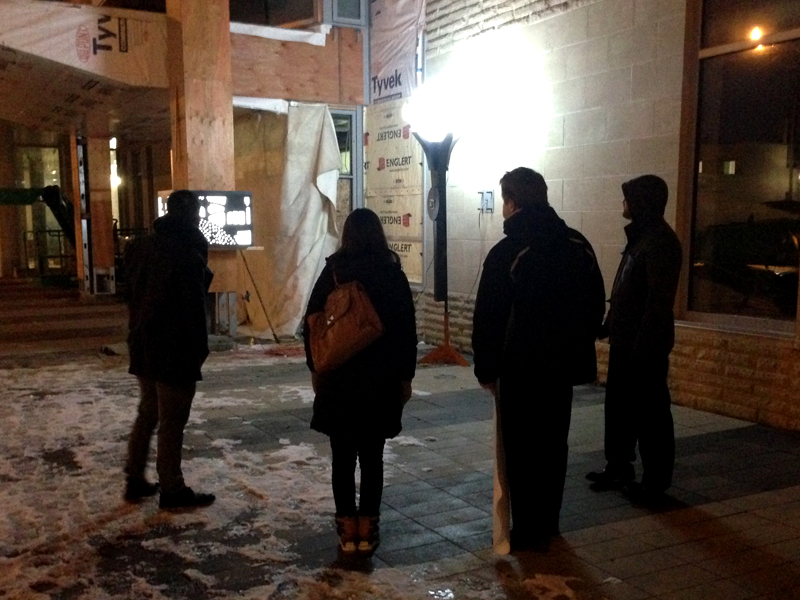 The design has now been formally approved and a wooden mock-up viewed by the committee to facilitate decisions regarding color and lighting of both our fixtures and the portal decoration, designed by artist Laura Cooperman and being fabricated by Signature Lighting, Cleveland. Check back for future updates! Great to have shared this event with many friends! For those we missed … perhaps we’ll see you at the next one! One day only this year! We’ve decided not to host a full open house this year, perhaps repeating them every two years … but wish to provide an opportunity for you to acquire those special presents. 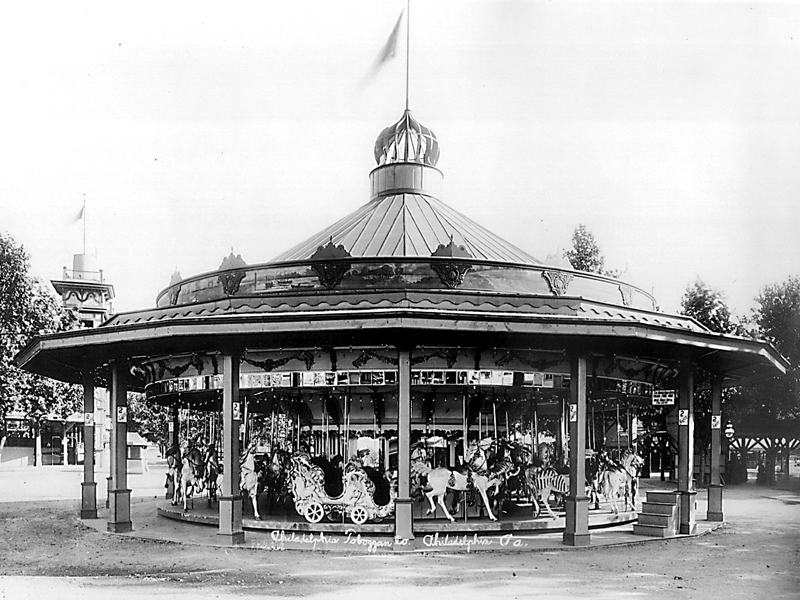 RIW is chosen to create Onion Top for restored Euclid Beach Carousel. 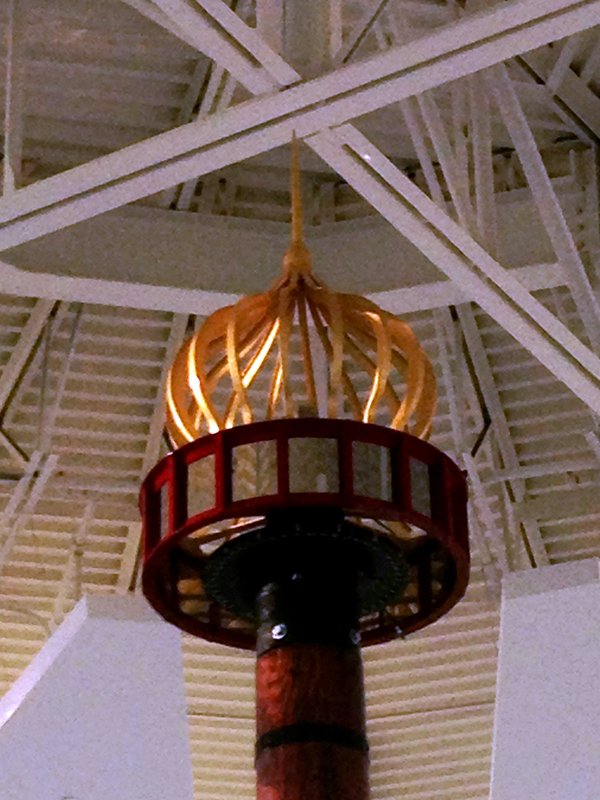 We were chosen by Raymond Rackley and John Frato of the Euclid Beach Carousel Society to design and produce an onion shaped top for the original carousel being restored by The Carousel Works and installed in a new addition to The Western Reserve Historical Society’s museum in University Circle, Cleveland. 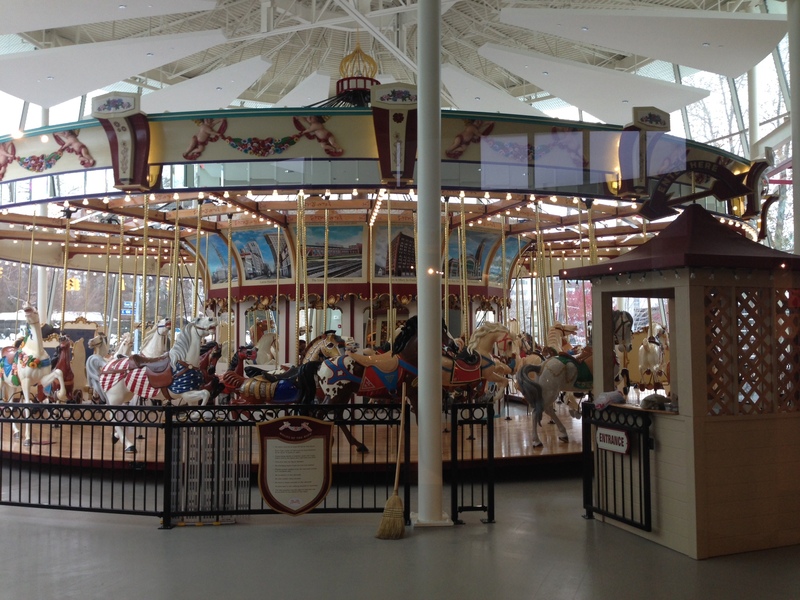 The carousel has a unique place in Cleveland’s heart .. and will delight riders of all ages in its new home. The society wanted to top the carousel with a piece as close to the one on the original building as possible (pictured below) We are honored to play a role in providing the “capping jewel” for this project!! 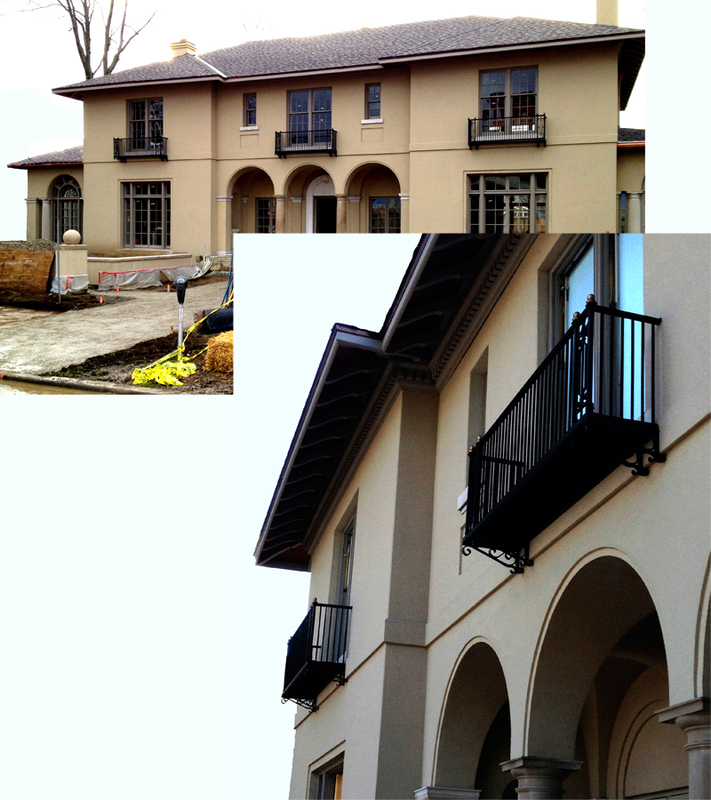 More fun pictures and reading about this historic project! Rose Iron Works was featured in an in depth article about The Hangar, an elegant sports complex designed by Abram Garfield, which was added to the Dudley S Blossom estate in 1930. Evelyn Theiss provides the reader with carefully researched history as well as photographs of one of Cleveland’s deco treasures, not normally open to the public. 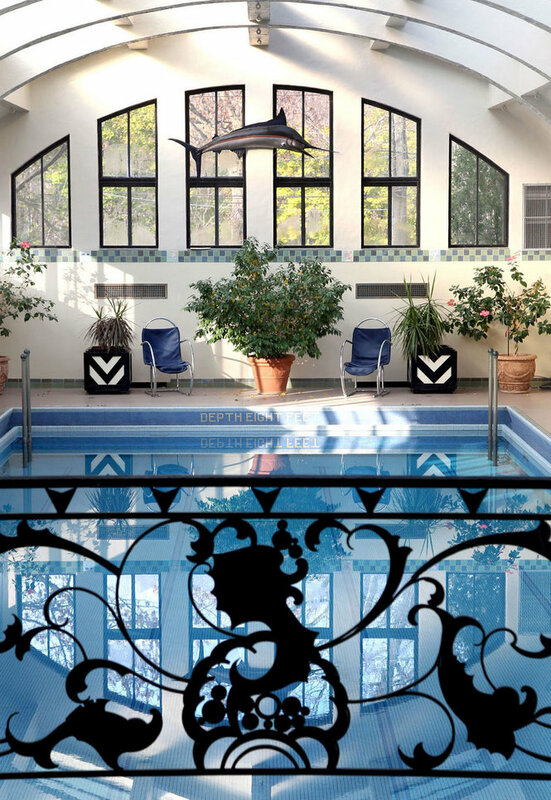 Commentary by Paul Westlake, Westlake Reed Leskosky, and Dr Richard Distad provide insight about the structure, its renovation by current owner Charles Bolton as well as anecdotes about Blossom Family use. 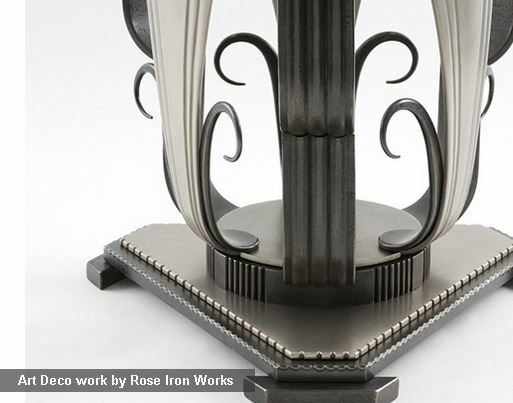 Leading authority on Art Deco Metalwork to Speak on Edgar Brandt and Rose Iron Works. 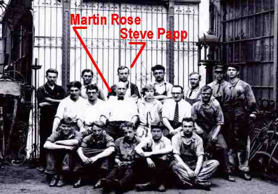 Kahr, Brandt’s biographer and also authority on Paul Fehér, Rose Iron Works’ designer during the early 1930’s, will present a slide lecture Friday evening at the Cleveland Museum of Art. Kahr, a graduate of Adelphi University, received her Master of Arts in European decorative arts from the Cooper-Hewitt, National Design Museum/Parsons School of Design. She has lectured on French ironwork at the Bard Graduate Center, the Cranbrook Academy of Art, and the University of Pennsylvania. She and her husband live on Long Island, NY. 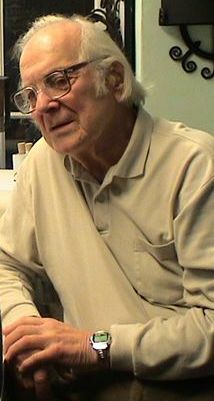 Michael Beyer, president of the 20th Century Society USA and a prominent member of the World Congress on Art Deco, was raised in Parma and is a specialist in family medicine with the Adena Health System in Washington Court House, OH. St James Church Reopens!! 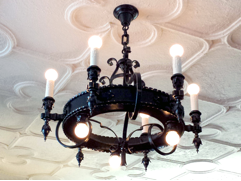 ….. Rose Chandeliers will be enjoyed once again. We are delighted to join the immense group celebrating the reopening of St James Church. 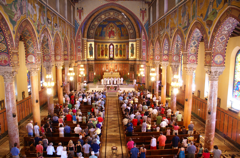 The Cleveland icon was locked in 2010 as part of a diocese wide downsizing by Bishop Richard Lennon … and saved by extensive efforts by the community resulting in a Vatican reversal of the decision. 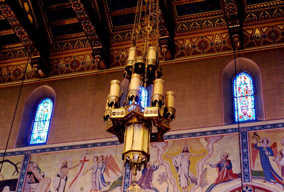 Martin Rose and Rose Iron Works craftsmen created the numerous chandeliers and ancillary light fixtures throughout the sanctuary during the early 1930’s. A Moment in History Came Alive at Rose Iron Works … with more to come! Ann DeBolt, granddaughter of Steve Papp — a key Rose blacksmith during the 1920’s — visited from her home in Texas, her first return trip to Cleveland in over 40 years. DeBolt brought a photo of her Grandfather stationed at his anvil, a vignette we were able to re-create with Ann standing exactly where Papp had once worked. 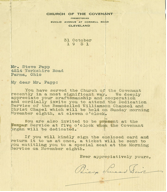 Among the items she brought along to share was a letter to her grandfather from the pastor of the Church of the Covenant (Cleveland) inviting him to attend the 1931 dedication service of the then remodeled chapel for which RIW had just completed significant work. Coincidentally, exciting developments are taking place at the church!!! We are currently producing new organ loft railings, designed by architect James Watson, which will be installed later this year in the recently refurbished sanctuary. History repeats! Reverend Campbell, James Watson , Rod Keen (chair Building and Grounds), Paul Williams (president of the Society) and many others have literally performed miracles reworking the woodwork, floors and lighting. This effort has been widely recognized as evidenced by winning the national AIA restoration award as well as regional award along with Webber Murphy and Fox architects. 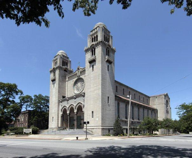 Bob Halper, Halper Lighting Solutions is currently designing a fascinating mechanism for nighttime illumination of the rose window thanks to funding from University Hospitals. 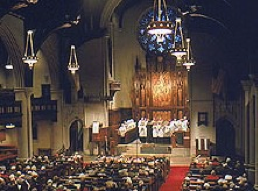 Our entire community will delight in listening to the new organ which will be installed this fall. 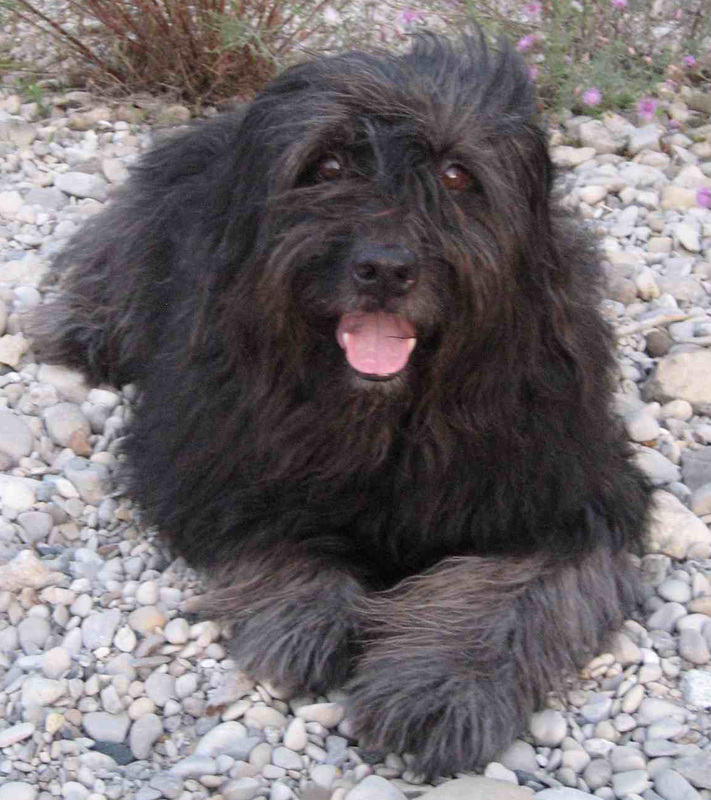 Per the classic “when a door closes, a window opens” … we are convinced that Kirby was sent to us by Roxie. He was recently found in Philadelphia …. lost, tattered and in want of a loving home … and has now joined both Bob’s family and our staff as Greeter. 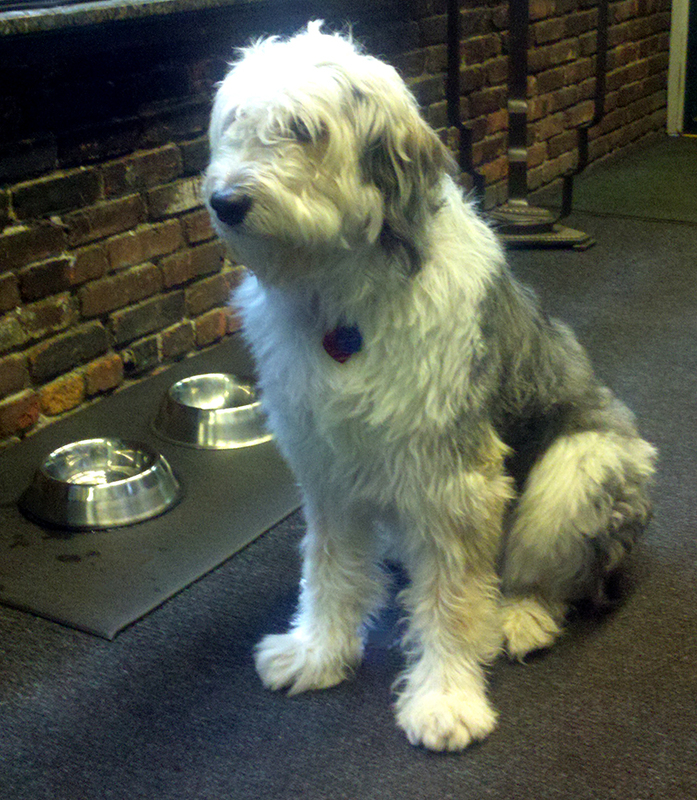 Furry friends are an important part of our studio culture, to many of our visitors as well. Our entire staff as well as hundreds of visitors have fallen in love with Roxie. Rox was our “greeter” … always happy to make new acquaintances or to welcome friends. She brought loving warmth to us each and every day. At 14, both old age and cancer took their toll … she died “while at work” on April 5, 2012. We cherish her memory …. and will forever miss her. 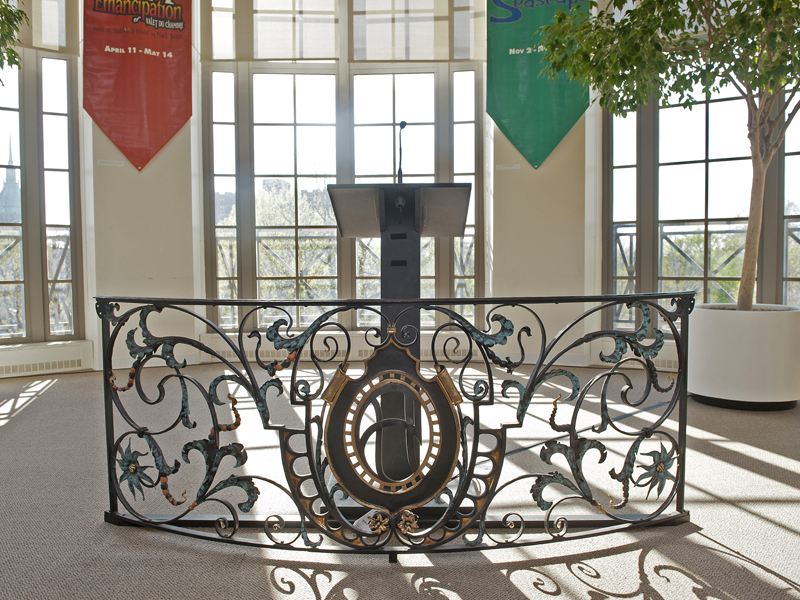 Original Rose Iron Works Drury Railing (section) on display at Case Western Reserve’s Kelvin Smith Library. 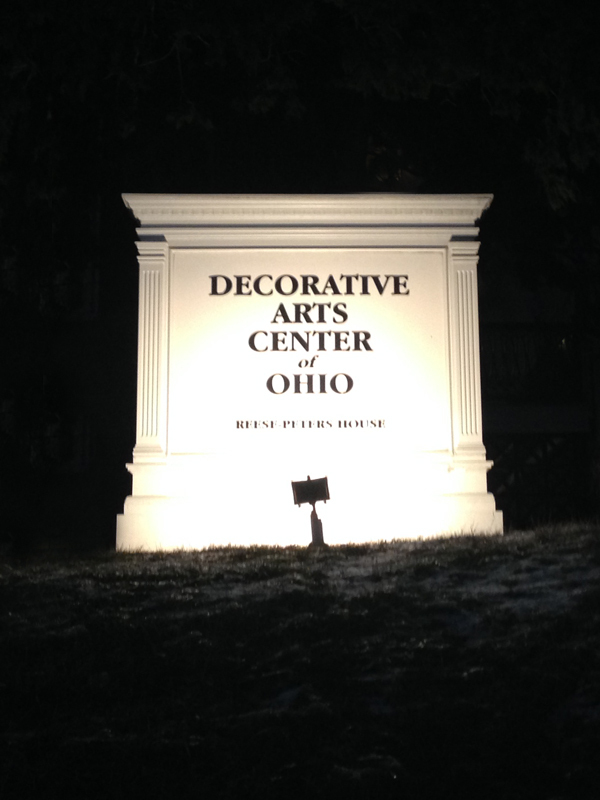 In celebration of their acquisition of the Cleveland Playhouse Archives. 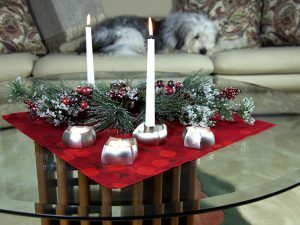 See us at the MOCA Fall 2011 Artscape for pre holiday shopping! A delightful video of Melvin Rose speaking about his career is posted to Cleveland Arts Prize web site. 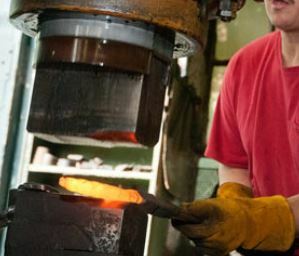 Clips also show RIW Smith Jim Tyson forging various items. 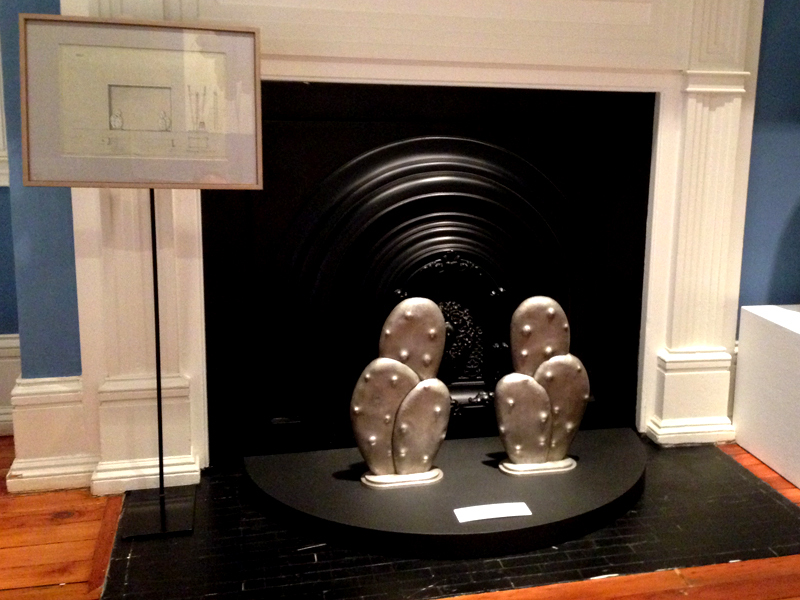 A whimsical chair created by Stephen Yusko, Rose Iron Works artist-in-residence, was displayed at the 2011 Ingenuity Fest. 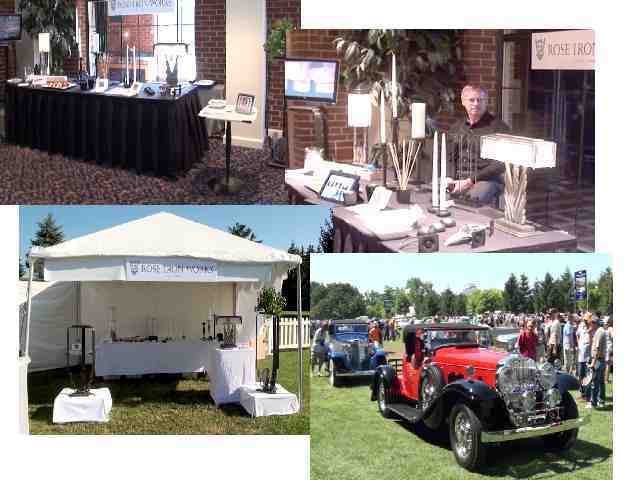 Bob and Barbara Rose, along with Stephen Yusko, attended and exhibited at the Concours d’Elegance of America in Plymouth, MI on July 29-30. Collectors and enthusiasts from the USA and abroad gathered to buy, sell and show some of the finest vintage automobiles in existence today. Featured in our display, part of the Concours d’Elegance of America’s Invitational Automotive Art Exhibition, were several Art Deco pieces, presented as a unique complement to the classic theme of this exciting weekend. Compliments flowed freely as discriminating attendees drew comparisons between the design and craftsmanship of our work and that of the Rolls-Royce, Duesenberg, Stutz and Mercedes vehicles of the same period.